Your HSA earns interest just like a traditional savings account. But did you know that once your balance reaches at least $1,000 that you can invest any portion above that in a wide range of mutual funds to help you maximize your HSA earnings potential over the long term. The cash account can be used for your short-term needs and transferring funds to your investment account can help you save funds for health care expenses in the future. Cover your short-term health care needs. Investing can help maximize your tax-free earning potential and get closer to your long-term savings goal. See how investing just $2,000 annually can really add up! Note: When selecting investment funds for your HSA, take into consideration your overall portfolio strategy in other longer-term investments such as a 401(k) plan or IRA to ensure you are aligned with your financial goals and priorities. Did you know a 65-year old couple could need $273,000 for health care expenses in retirement? 2 Using the investment feature of your HSA allows your balance to grow in mutual funds similar to your 401(k). In retirement you can make a tax-free withdrawal from your HSA to pay for eligible medical expenses, potentially saving you thousands of dollars in taxes. How does the investment feature work? First, you need to set up automatic investment transfers and establish your cash threshold ¬ – this is the amount you want to always have in your cash account. 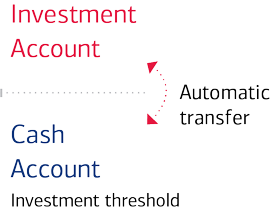 Then, whenever you contribute or withdraw from the cash account, money will automatically be transferred between your cash and investment accounts to maintain your cash threshold amount. Not sure how much to set as your threshold? Here are some suggestions to help you determine how much to set. 1 About Tax Benefits: You can receive tax-free distributions from your HSA to pay or be reimbursed for qualified medical expenses you incur after you establish the HSA. If you receive distributions for other reasons, the amount you withdraw will be subject to income tax and may be subject to an additional 20% tax. Any interest or earnings on the assets in the account are tax-free. You may be able to claim a tax deduction for contributions you, or someone other than your employer, make to your HSA. Certain limits may apply to employees who are considered highly compensated key employees. Bank of America recommends you contact qualified tax or legal counsel before establishing an HSA. 2 Employee Benefits Research Institute, December 2017. A 65-year-old couple, both with median drug expenses would need $273,000 to have a 90% chance of having enough money to cover health care expenses (excluding long-term care) in retirement. Savings Needed for Medigap Premiums, Medicare Part B Premiums, Medicare Part D Premiums and Out-of-Pocket Drug Expenses for Retirement at age 65 in 2017. A 65-year-old man would need $131,000 or a 65-year-old woman would need $147,000 to have to have a 90% chance of having enough money to cover health care expenses (excluding long-term care) in retirement. Savings Needed for Medigap Premiums, Medicare Part B Premiums, Medicare Part D Premiums and Out-of-Pocket Drug Expenses for Retirement at age 65 in 2017. 3 Withdrawals for non-qualified health care expenses are subject to income tax. Certain associates are registered representatives with MLPF&S and may assist you with investment products and services. You have the choice to keep your HSA funds in your cash account which can earn interest similar to a savings account, or you can leverage the investment option in your HSA. To maximize your HSA benefits, you'll need to understand it, max out your contributions, grow your savings, invest and consider catch up contributions.